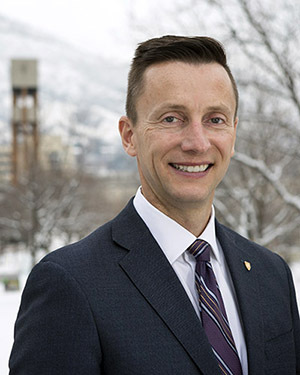 I am honored and humbled to serve as the 13th president of Weber State University. I love Weber State and what we stand for as a university. I've been able to witness the impact that we have on our students, alumni and the community for the past 14 years. As I step into this new role, I hope we can forge an even brighter future for Weber State University. For more than 130 years, Weber State has worked to meet the needs of our community and region by providing access to a quality education and lifelong learning opportunities. These core themes of learning, community and access continue to guide our university. We have so many outstanding things happening at Weber State, that every day is a great day to be a Wildcat. In the weeks and months ahead, I look forward to getting out, having conversations with you, hearing your perspectives, and building a shared vision that will help our university thrive for generations to come. Let's do this! Weber State, Weber State, Great Great Great! !